The Ideal Pet Products Designer Series Original Plastic Pet Door provides a simple and convenient way for your pet to get in and out of your home at his leisure. The safe and simple design makes it easy to install and you can feel confident knowing that the tinted vinyl flap is temperature resistant, so it won’t warp from extreme temperatures. The flap is also designed with magnetic closures on the bottom, ensuring that the floating bottom threshold stays perfectly sealed every time. Best of all, this door comes with a lock-out, slide-in panel to keep pets inside at night or when you’re out running errands! 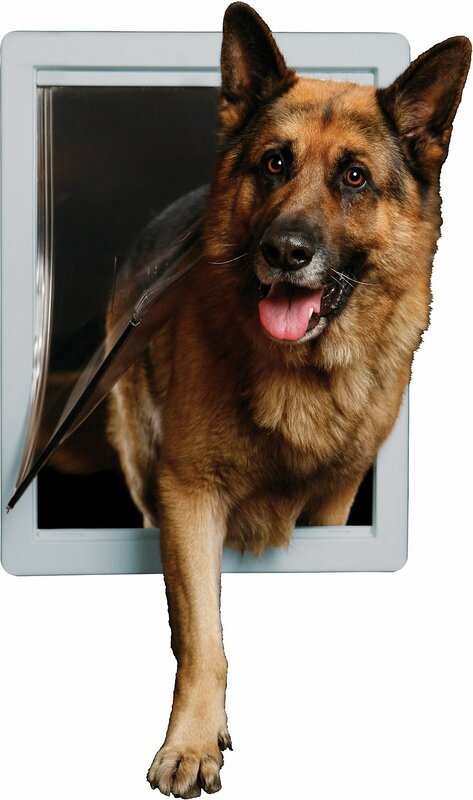 The rigid lock-out, slide-in panel provides a great way to help keep your pet in or out. The magnetic flap closures provide a strong seal for added protection from airflow, allowing your home to be more energy efficient. The frame is conveniently compatible with any standard interior or exterior door. Constructed with sturdy plastic and a non-toxic vinyl flap for a durable pet door that can withstand everyday use. For easy wall installation, get the Ideal Pet Products Designer Series Ruff-Weather Pet Door Wall Kit (sold separately). I was thinking this had 2 flaps, rather than one, but the magnetic portion really works rather well. it was missing a screw but we managed to get it together with screws on hand and some Caulk. Doggo loves it, and we now have a private dog run for him so he can go out any time he likes and doesn't get cooped up when we are at work. This dog door was very easy to install. Perfect size for our labradoodle. The flap is even light enough for our cats and small dog to go through. The magnetic strip on bottom keeps the flap shut. Excellent deal for the money. A good dog door at a fair price. This door is well made and looks good on my screened deck allowing my schnauzer to go out into the fenced yard when she wants. It should last a long time and I don't need it to be insulated. The door works great. Cats love it. Only problem is it is designed for full thickness door, not for screen doors or for wall installations. I had to put a wood frame around it to make it tight on an outside wall application on the porch. We actually built it into our wall framing. It would work prefect as intended for a door. Its solid and easily installed. Love it and so do the pets! I purchased this item for our garage door for our two dogs and pet pig. All three are fairly large so we selected the super large size. My husband installed it in little to no time and it works perfectly. No complications with installation. All three of our pets got the hang of coming in and going out of the door within a few hours. It will be a lifesaver that’s for sure!